Contributed Photo. 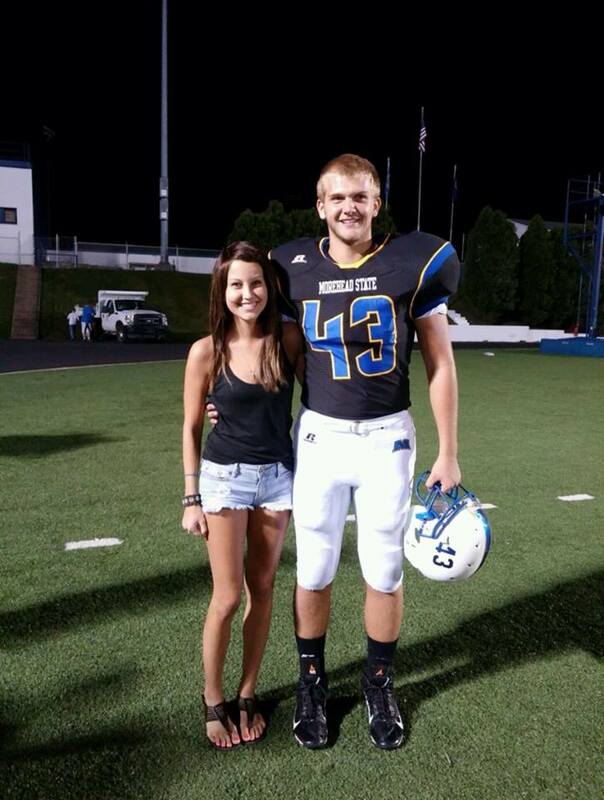 McKenzie Hicks (left) is shown after watching brother Braden Hicks (43) play football for Morehead State University. McKenzie Hicks has been cancer-free for more than a year. McKenzie Hicks works from 7 p.m. to 7 a.m. as a registered nurse in the Neonatal Intensive-Care Unit (NICU) at Cincinnati Children's Hospital with babies 24 to 42 weeks old. The 2009 Highlands graduate and former standout soccer player admittedly has her good and bad days. But she'll take that normal life compared to where she was starting in February, 2011 when doctors first diagnosed her with a Cancer called Hodgkins Lymphoma. "It's a big joy," Hicks said. "When I'm at work and if I'm having a hard night, I just sit there and think I at least get to go home. I know what it's like not to be able to go home at the end of the day. It really humbles me as a nurse. I feel like I can be a better nurse than if I didn't go through cancer." While many may link her to forever being a cancer survivor on not just one, but two occasions, Hicks has one wish. That has not changed since a conversation with her dad Jim about the time of her first diagnosis. “I just want to be McKenzie," Hicks said. "I don’t want to be McKenzie with cancer." That journey back to a normal life started one day when she felt sick. She went to the Emergency Room and had blood tests and an MRI to reveal the cancer. Hicks received treatments for six months the first time and for a year when the cancer returned. But Hicks has been cancer-free for more than a year now. Hicks helped the Ladybird soccer program to its amazing run of 80-11-11 as a defender. Highlands won back-to-back state championships her freshman and sophomore year before finishing state runner-up in 2008. "I honestly feel playing soccer my whole life has prepared me for fighting cancer," Hicks said. "It's given me the determination and the motivation to want to beat it, to want to win such a thing. I think that having that competitive spirit in any sport can help you be successful in anything you do in life, especially when it comes to fighting for your life." A number of people reached out to Hicks during her cancer battles. But Jade Riffe, a 2009 Highlands graduate, stayed by her side more than a lot of people. "When you see a friend struggling, it’s impossible not to be there," Riffe said. "Going through something like that and being in the hospital for days and months at a time, I don’t know how you can not be supportive of somebody, especially such a great friend. She’s a good person. When you see her perk up because she’s been in there for days, it just makes you feel so good." Hicks' twin sister Molly in addition to other family members have also been by her side. The two played soccer at Morehead State for a couple years after graduating from Highlands. "It’s honestly not something I can put into words, but life has been absolutely amazing with McKenzie," Molly Hicks said. "She is literally my other half. To be able to go through life with your best friend and other half is the best gift I’ve ever been given. She brings so much joy to my life every single day. No one understands me like she does, and life wouldn’t be worth living if I didn’t have her by my side." McKenzie Hicks said she could not be an Oncology Nurse for now. That's because she'd not be able to separate her emotions toward cancer patients. But she said people beat cancer in more ways than one. "I feel that anyone that’s gone through cancer has that unsaid bond," McKenzie Hicks said. "You just feel that emotional connection with people. One of my biggest pet peeves is when people say so-and-so lost their battle to cancer. I don’t feel that anybody ever loses even if someone does pass away. I feel that anyone who has to go through that is a winner from the beginning just because they have the hope and courage to try to fight it in the first place." In her off time, McKenzie Hicks goes to watch her family play. It could be her brother Braden down at Morehead State or her cousin in freshman forward Lindsey Meyer. Meyer scored 44 points on 17 goals and 10 assists as the Ladybirds finished 15-9 this past fall. "I'm really proud of her. I know it’s really hard being a freshman and playing with a bunch of upperclassmen," McKenzie Hicks said. "I think she’s really making a name for herself. I just encourage her to keep doing what she’s doing. It's good to see someone else in the family carry on the name in soccer. There are a lot of boys in our family – a lot of football players, a lot of baseball players. It’s good to see someone play soccer." Numerous stories have been written in recent years wondering if cancer is linked to soccer players diving on turf crump rubber. But McKenzie Hicks said there is no scientific evidence linking the two.